This match is highly anticipated and it is for a concrete reason. The two legends are reportedly supposed to earn up to 100 million from the match. The fans also want a piece of the action. By lining up a pre-fight haymaker bet you secure yourself a chance of getting a free bet worth £20. This is so long as McGregor gets through the 12 rounds. All you have to do is log into the 10bet and place the pre-event bet and be on your way to getting a chance in the promotion. Conditions of the game promotion. There are some terms and conditions to ensure that a person qualifies for the bonus. some of this include. The game is scheduled to take place on 27 August at 02:00BST. This means that the offer is valid only before the match commences on that day. The offer is restricted to once per customer. It means that one customer cannot qualify for the offer twice. For a customer to qualify for the offer they must have some money in their Sports Cash Account. A customer must also place a qualifying bet on the match.A qualifying bet is the first real cash in the customer’s account. 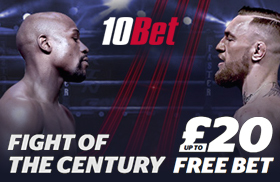 If a customer loses after all the 12 rounds have been played the free bet amount will then be added to their account. The amount is to be credited to the account within 48 hours. The amount is dependent on the number of the customers qualifying bet. It is important to note that the maximum amount of free bet is £20. Cancelled bets, draw bets or bets that have been placed using a free bet shall not be considered as qualifying bets. The free bets awarded can be used on any sports betting market`available. The bets shall, however, expire from the customer’s account after 7 days of being credited. Winning gained from the free bets are credited to the account and are withdrawable. These are just some of the conditions of the 10bet promotion. So many people are interested in this game and are also investing in it. The question that everyone is asking is who will take home the bragging rights between this two great fighters. It is an exciting time for people who are true game lovers.